This is an old stamp from Visual Image Printing ~ not sure the company is even around any more. The “Happy Retirement” stamp, square lattice embossing folder, and word label punch are all from Stampin’ Up. The dot embossing folder is from Cuttlebug. The 3 1/2-inch circle punch is from Marvy Unchida. Stamp the image with black ink on white card stock, color with Copic markers, and punch with the circle punch. Emboss a panel of green card stock with the square lattice folder and attach it to a white card. Emboss a strip of blue card stock with the dot folder and attach it to the card. Attach the stamped image with with pop dots. Stamp the sentiment with green ink on white card stock, punch it out with the label punch, and attach it to the card with pop dots. You could easily change the sentiment to make this card for another occasion. 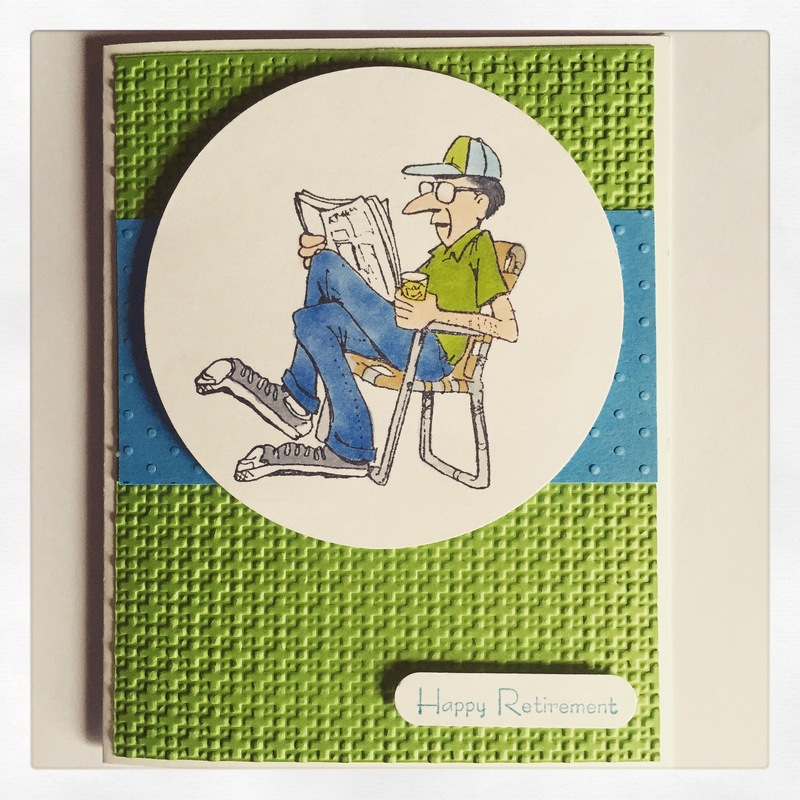 Just a simple little card to congratulate our friend on moving on to a less (or maybe more) hectic life as he enjoys his retirement!